This policy gives a description on how Bitmango (“us”, “we”, or “our”) collects, stores, and uses information about you applying to all of our games on mobile devices, PCs or on other platforms in order to provide you and develop our products. Your information is collected at the start of using our games and/or other Services, such as http://help.bitmango.com and our website. Personal data include, but are not limited to: your name, country and region, address, email address, device information, and game play information. We use this data to provide you with better of our games and Services in purposes of optimization, preventing fraud, and for marketing and advertising. We may also collect information from advertising platforms and partners and other third parties such as information about purchases and interests. In more detail, the collecting information consists how you play our games (such as which item and how much of them got used, levels attempted and purchases made) and any permitted information you grant when creating an account with us and connecting to your social network accounts. the playtime of yours using our app. if you have left the game on a specific level or if you have cleared it. the score you earned in levels. the items you use, purchase, and/or own. in any contact between you and us, we may keep a record in purposes to give best answer to provide you a better experience using our app. purchase history on behalf of our payment service providers to keep a record on if a purchase has been successfully made. We do not collect credit card information. the type of your device, IP address, your game ID when using the app, and the country or region that you’re playing in. If you choose not to connect to your social network accounts when using our games, we collect anonymous information and still there will be a device level identifiers and other information described here. We may ask for your approval to collect other information in some circumstances from you or your device. Or any other similar activities be done we will inform you what information we are to collect, the reason we collect it, and how we will be using that information. For the other purposes we may share your information with third party publishers who develop and provide games and other Services to your on our behalf. We also use the information collected for analysis reason on an anonymized or aggregated basis to develop the products, to analyze the performance of our games, to troubleshoot and to enhance the quality and optimize the games to guarantee the best experience to those who use our Services as a whole. We analyze and optimize to provide you the best of our products using your information included with use and analysis of aggregated data to verify that our websites work properly on all devices. Your information data delivered or provided directly to us in communications in terms of customer service and through its channels will be used. We may use such information to contact you and to manage your account and relationship with us to improve your experience in our Services. Our customer service channel is found at help.bitmango.com/new/. We collect information using analytics tools such as third party analytics tools to see how you play our games or use our Services. Those tools may contain cookies or other similar tracking technologies. We may use your data for research and analytics purposes to engage with you directly. We may also create reports, analysis or similar services for use by us for the purposes of research or business intelligence. There are social and community channels we use to communicate with our players, we will receive your information only when you choose to interact with those channels, information be used in connection with those channels. We will more closely engage with you through those channels and may republish your posts to those channels. We may serve ads based on your information we collect about you within our Services or place ads on third party websites, apps and internet-connected devices. Information we may have about you such as: ad identifiers and other non-personal information collected from your device, how you interact with our game and Services the game play information, your age, country or region, and gender, and other information collected from third parties with legal right to share it with us are used to make sure that you only see marketing from us that might be of interest to you. There are various third party marketing partners we use when we market our games in media. With the help of your information collected when you use their services, they make assumptions to ensure that most relevant advertising that you would prefer to see is presented. We’re not responsible for data use of our marketing partners though there’s always a legal basis required for them to use your data for marketing purposes and to provide you the details on how it’s being used. For more information we recommend for you to scan through our partners’ privacy policies on their websites(a full list can be found here). Our games are included with third party advertising for their products and services. We and our partners use your information to improve advertising and targeting to measure the relevant third party ads to show in our games. Information we may have about you such as: ad identifiers and other non-personal information collected from your device, how you interact with our game and Services the game play information, your age, country or region, and gender, and other information collected from third parties with legal right to share it with us are used to make sure that you only see ads from us that might be of interest to you. Non-personal identifiers and other information collected from your device when you play our games or use our Services are shared with advertising partners in order to technically deliver the ads to your device. Such information may be combined with collected information of our advertising partners own to serve you with more relevant ads and to enhance the accuracy of their targeting. For more information we recommend for you to scan through our partners’ privacy policies on their websites(a full list can be found here). We use ad identifiers that are non-permanent, non-personal identifiers such as the Android and/or Apple’s ID for advertising associated with your device, and similar technologies such as tracking pixels within ads to provide interest-based advertising. These technologies enable us and our third party advertising partners to recognize you and your device, allow our Services to interact with a third party social network or platform and help our payment processors to work it out your payment instructions. You may reset your ad identifier being used for interest-based advertising by changing the settings of your device usually found under “privacy” or “ads”. You can also opt-out from your information being collected if you live in the USA, Europe or Canada by visiting http://www.aboutads.info/choices/ (for US users), http://www.youronlinechoices.com/ (for European users) or http://youradchoices.ca/choices (for Canadian users). The full use of our Services may not available if you choose to adjust your preferences. If you wish to know which information we collect and hold about you please contact us so we can verify your identity to provide you with requested information. If the information hold personal information about someone else we may not allow to give all the information asked for. If there is any information we hold about you that you would like to correct, please let us know at help@bitmango.com we will make corrections as soon as possible. If you wish to delete any information about you, please contact us knowing that in order to complete the process you must delete our games from your mobile devices. There may be some information we will be still holding for other purposes such as protecting legal rights or maintaining financial records and marketing suppression lists. Any anonymised form that holds of your information may be retained as well. You can deactivate your account you created in our game by contacting us. Please note that we may ask you about other information such as your mobile device information and once it is completely deactivated your unspent virtual items may not be remained. You have the right to request the data provided to us to be transferred to another data controller in some circumstances. You may request a restriction of the processing of your data in some circumstances. You have the right to object to the processing of your personal data unless we indicates compelling legitimate grounds for the processing which ignores the interests, rights and freedoms of the data subject. Please follow the opt out link if you would like to receive direct marketing communications from us. If you choose to receive more than one type of marketing communications, you may need to opt out of all of them individually. A few days might take for our records to be effectively updated. Our Services may offer social sharing features and other integrated tools enabling share actions you take in the apps with other media. You must be over the minimum age limit prescribed by the legislation in the individual jurisdictions to use such social sharing features which may, depending on the settings you set with the entity, share information with your friends or the public. To use and play our Services you must be over a certain age depending on where you live. For the full list of age restrictions by country, please see below. We do not knowingly collect personal information from or direct or target interest based advertising to anyone under the ages set out below. We also do not knowingly allow such persons to use our Services, if in any way such personal data have been processed under the age set out below, please contact us so we can delete that information as quickly as possible. 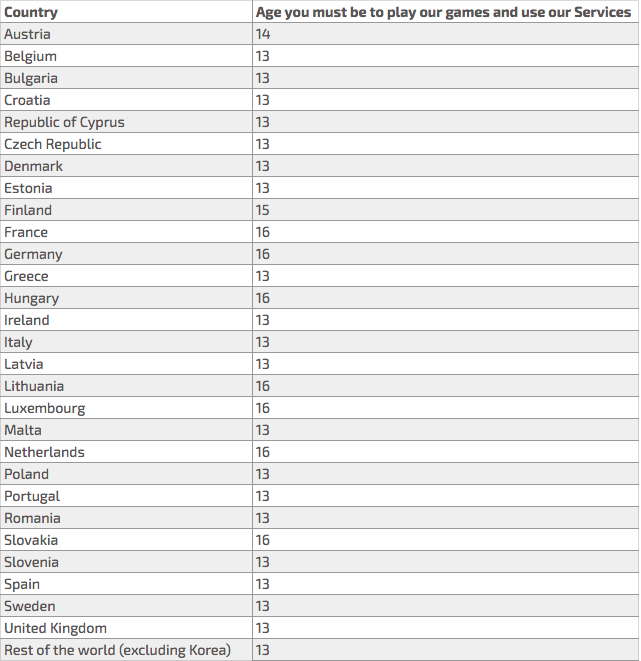 Please see below listed with age you must be to play and use our games and Services depending on which country you are in while using our games and Services. Please do not play our games or use our Services if you are under the relevant age.